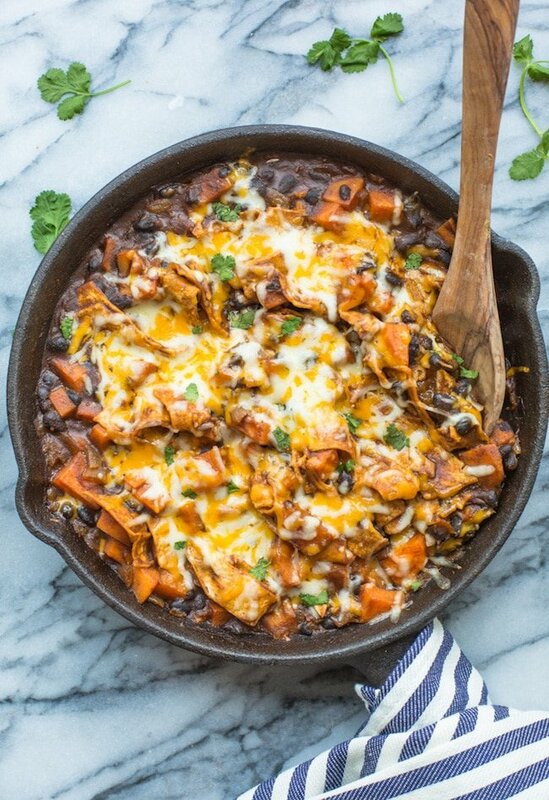 All you need is one pan and about 30 minutes to make these wonderfully cozy, cheesy, veggie filled Sweet Potato & Black Bean Enchilada Skillet. I’ve included a recipe for enchilada sauce in the recipe because I’m not impressed with the limited gluten free options we have at our local grocery store. That being said feel free to use store bought if you want to cut down on time and ingredients needed. If you do choose to make your sauce from scratch it’s an easy enough process and only adds another 10 minutes to your cooking time. Making it yourself also allows you to choose your preferred level of spice (depending on how spicy your chilli powder is). Altogether it’s super easy with a few basic ingredients & spices that you probably already have on hand. Start out by sautéing your onion and garlic for a few minutes and until soft and fragrant. Add the sweet potatoes and chipotle paste and cook for about 10 minutes or so to soften the sweet potatoes. If your pan starts to look a little dry add a little bit of water to the pan to create steam to help the potatoes soften. 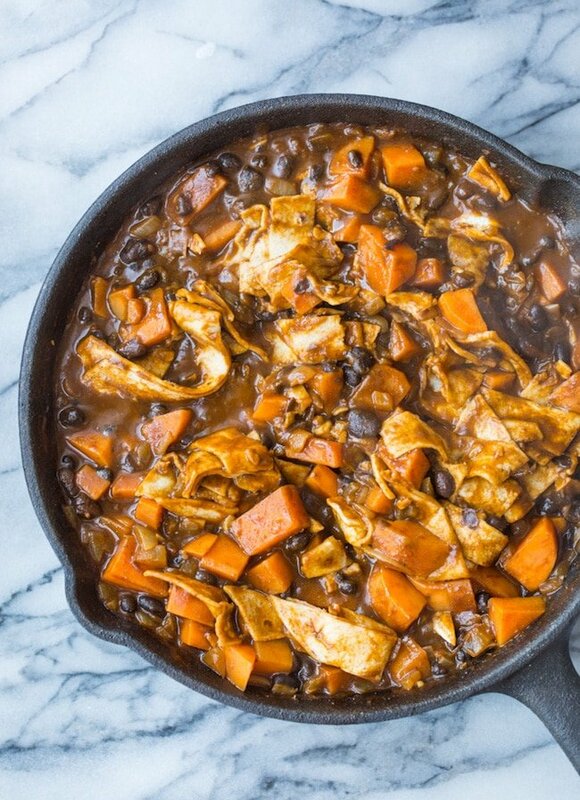 Stir in your spices followed by the black beans, enchilada sauce and corn tortilla strips and mix well until everything is fully combined. Finally just sprinkle the cheese over the top and then place under the broiler for up to five minutes to melt the cheese and you’re all set! Serve this along side some cilantro lime cauliflower rice for an even more veggie packed meal and top of with homemade guacamole and tortilla chips for good measure and you’re in for a good night! 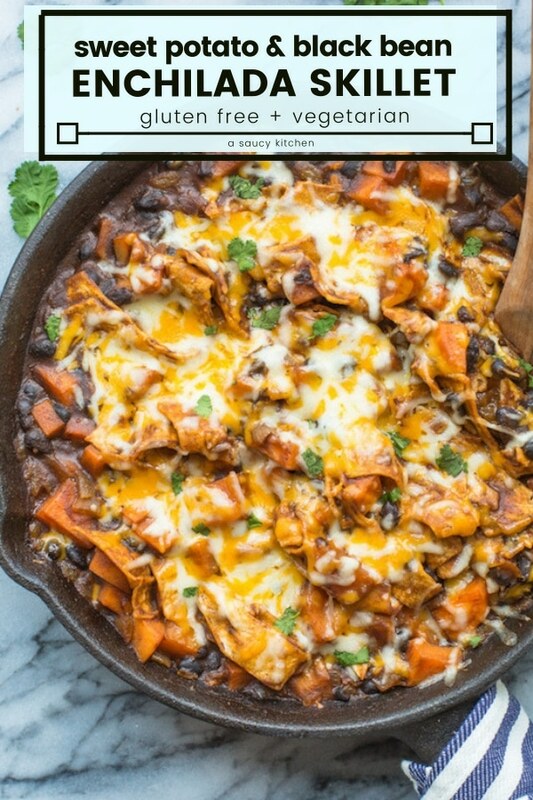 Don’t forget to #asaucykitchen on instagram if you this Stove Top Sweet Potato & Black Bean Enchilada Casserole ! 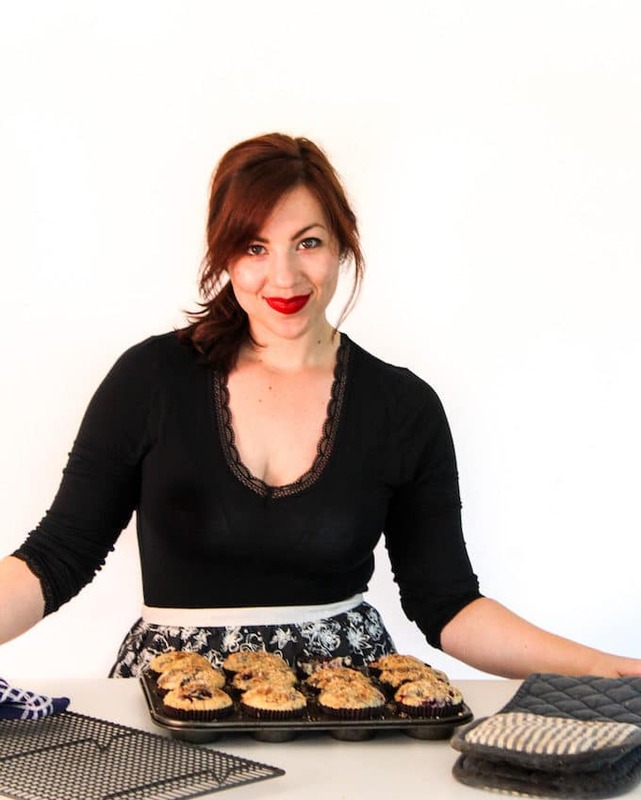 I love seeing what you make! You can also post your pictures to my facebook page! In a small sauce pot warm the olive oil. Add the flour and seasonings to the oil and stir together to form a roux. Add the stock and whisk it all together to remove any lumps in the sauce. Let the sauce simmer on the stove for 7-10 minutes. Remove from the heat until you're ready to add it to your casserole or store it in an air tight container in the fridge. Use it within 3 days. In a large oven safe skillet or pot warm the 1 tablespoon of olive oil on a medium heat. Add the diced onions to the pan and sauté for about 5 minutes minutes until soft and tender. Add the garlic, sweet potatoes and chipotle paste and continue sautéing another 10-12 minutes until the sweet potato is fork tender. Add a tablespoon or so of water to the pan if it starts to look a little dry. Stir frequently to keep the garlic and potato from burning. Add the oregano and cumin. Lower the heat and stir in black beans, corn strips and enchilada sauce. Stir well to mix coating everything in the enchilada sauce. Let simmer for a few minutes. Turn on the oven broiler to high. Sprinkle the cheese over the top of the skillet. Let broil for 3-5 minutes until the cheese is melted and starts to golden. Remove from heat and serve immediately. Top with cilantro, sour cream and/or guacamole and serve along with tortilla chips an/or cilantro lime cauliflower rice. I made this for my family this evening and they absolutely loved it ! Is it possible to freeze this at any stage of the recipe? Hi Emma! So glad you enjoyed it! 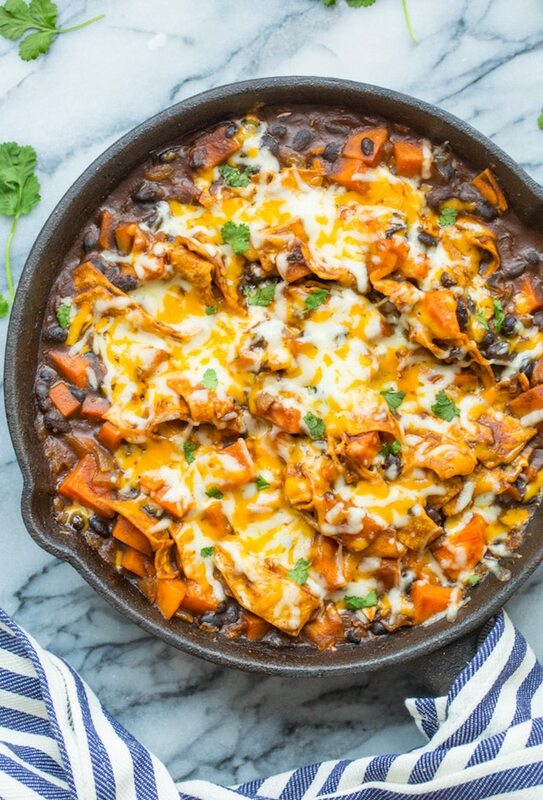 I haven’t tried freezing this yet but I do think you’d be able to freeze the beans and sweet potato enchilada mixture before adding the cheese and the corn tortillas. After you thaw you should be able to warm it back up add the remaining ingredients pretty easily!